Figures Toy Co. revealed a sneak peek of their third wave of exact replica Mego World's Greatest Super Heroes to the Mego Museum. Not sure why they didn't share it with me, but whatever. Maybe one day they'll learn. In the meantime, I am going to share with you what I've heard. This latest wave will include Removable Cowl Batman, Removable Mask Robin, Batgirl, and wait for it, wait for it...Alfred Pennyworth. 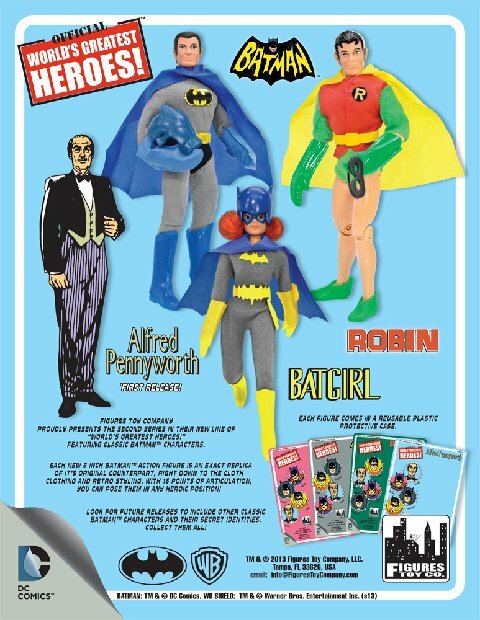 Mego never produced an Alfred action figure. So, this new and unique figure will be the first of original figures from Figures Toy Co., which I think is very exciting. I was originally going to buy this entire line, but I have had some second thoughts on doing so. I already have many of the original Megos that Figures Toy Co. is recreating and I might just pass on getting the replicas of the characters I already have. Instead, since I don't have originals of figures like Catwoman or Batgirl, which I have always thought of as dollies. A certain colleague of mine refer to all Megos as dollies, but for me it's the female versions only, however, I think I am going to wait until this third wave is released before I jump on this bandwagon. Unless, I can be convinced otherwise of course. Or until I just can't resist any longer. The fact they are doing Alfred is just awesome! Maybe we will get to see more original ones like this in the future too!